Having one or more missing teeth can change the way you feel about your smile. Finding natural-looking replacements that can also improve your dental health can restore your confidence in the appearance of your teeth. Dr. Gregory Kuo has restored the smiles of many people living in and around Redmond, Washington. Call or schedule an appointment online to learn more about how dental implants can work for you. Dental implants are a durable and long-lasting solution for tooth loss. They’re replacements for missing teeth that Dr. Kuo can install permanently or temporarily. Three pieces come together to form a dental implant: a post, an abutment, and your new artificial tooth. Posts and abutments are the parts of the dental implant that keep everything in place. They can be made of titanium or ceramic. Artificial teeth can be made of porcelain, metal or gold. Because Dr. Kuo surgically implants dental implants into your jawbone, they never shift or fall out while you’re wearing them and they never need to be adjusted. During the dental implant procedure, Dr. Kuo makes an incision in your gums, and he drills a hole into your jawbone. Next, Dr. Kuo places the implant and abutment inside the jawbone and allows them to heal so that a permanent bond can be created. Finally, he places a crown that matches the color and bite of your teeth on top of the implant. Dr. Kuo can do the entire procedure in one session or spread it out over multiple visits. You may experience minor temporary swelling, bleeding, and pain after the procedure. When compared with other tooth replacement procedures, dental implants offer a wide range of benefits. Dental implants don’t slip or become loose or ill-fitting over time, and they aren’t uncomfortable to wear. They never slip out of position when you’re speaking, and because they look natural, they can bring back your confidence in the appearance of your teeth and give you a new and improved smile. 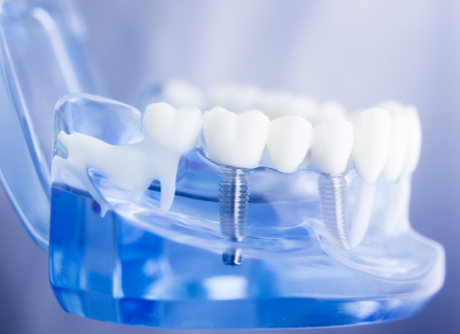 Unlike tooth-supported bridges, Dr. Kuo doesn’t need to remove or modify other teeth before installing dental implants, which means better oral health in the long run. Learn more about how dental implants can improve your oral health. Call or book an appointment online today.